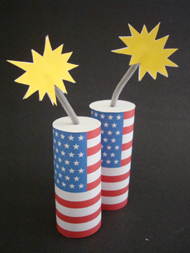 Make a Paper Tube Firecracker for your next celebration. You can color your own flag, or print on already colored! These are great party decorations or a fun party craft for preschoolers on up! • Printed B/W Flag to color* or Color Flag. * Any paper will do but a thicker paper like card stock will look a little better. 1. Trace around your paper tube on to white paper and cut the circle out. 2. Poke a hole in the center of your circle with a pencil or a pair of scissors. 4. Glue the pipe cleaner in between the "sparks" and insert the pipe cleaner in to the hole in the top of the tube.